NET employment growth has slowed sharply from more than 200,000 before the 2009 financial crisis to around 33,000 jobs yearly, on the back of business uncertainty and low births and an aging population. Manpower minister Lim Swee Say told Parliament on Monday, during the Committee of Supply debate on the budget for the Ministry of Manpower (MOM), that his ministry is working on four key strategies to not only ensure that there would be enough jobs for Singaporeans, but better ones as well. Responding to questions from backbenchers on job prospects at a time of slower economic growth and disruptions caused by technology, he identified the four key thrusts as ensuring quality job creation, raising workforce adaptability, enhancing inclusiveness and complementarity, and building fair and progressive workplaces. Ensuring quality job creation: The focus here is to create enough good jobs for everyone, he said, and added that Singapore should not waste time worrying about technology killing jobs; technology should instead be harnessed as a partner in job creation. Mr Lim said: "The real threat we face in the competition for jobs is not technology, but global competition. "We should focus more on how to partner with technology to take away customers and jobs from our competitors before they do it to us." This is the ambit of the Lean Enterprise Development Scheme (LEDS), which MOM launched over a year ago. LEDS brings together various agencies to offer a one-stop service to make it easier for small and medium enterprises (SMEs) to ramp up their business capability and gain access to labour and markets; where necessary, LEDS is even prepared to relax the foreign-work quota temporarily to expedite matters for these SMEs. Mr Lim said LEDS's scope will be strengthened this year, with new programmes introduced. It will help more SMEs go digital and expand overseas, and speed up the development and deployment of "cluster" solutions for firms; it will work closely with sectors to tackle the manpower shortage as well. The minister said creating quality jobs can prevent rising unemployment and under-employment, but structural unemployment - the result of mismatches in the labour market - still exists. This is where workforce adaptability comes in. Raising workforce adaptability: Mr Lim said MOM will make better use of technology to help job-seekers and employers find each other. The national jobs bank has been made more user-friendly to provide better search functions. The next big move is to transform it into a "one-stop, non-stop online marketplace" for various groups of job-seekers. He said: "We will link up the Online Marketplace with the Individual Learning Portfolio portal to be launched, so that we can provide seamless access between the two. These major enhancements will be rolled out progressively this year." Channels of job-matching services will also be expanded through closer collaboration with private-sector employment agencies; Mr Lim said MOM has found two partners which have experience working with government agencies in the UK and Australia. He said they were selected because of their business focus on active job seekers (people looking for jobs), not passive job seekers. "We will partner them to help place PMETs (professionals, managers, executives and technicians) who have been made redundant and those unemployed for three months or more." The new partnership will debut in the second quarter of the year. The minister said MOM will boost the Adapt & Grow initiative, which was introduced last year to help PMETs, who make up the bulk of workers in the workforce. The Professional Conversion Programme, also launched last year to help this group of workers to switch careers and move into growth sectors, will receive enhanced salary support. An "Attach and Train" scheme, which offers training allowance and attachment in companies in growth sectors, will be introduced to help PMETs prepare for new jobs in another sector. MOM is looking to start it in the logistics sector. Enhancing inclusiveness and complementarity: The slowdown in job and workforce growth makes each worker even more valuable, said the minister. "We (thus) need to strengthen the inclusiveness of our local workforce and to strengthen our socal cohesion." He said the local and foreign workforce must complement each other better to sharpen Singapore's competitive edge. Because Singapore can never be self-sufficient, foreign workers will be a "permanent feature" here. But they must complement us rather than compete against us, he said. This way, foreign workers will help narrow the talent gap and create more good jobs for Singaporeans. Mr Lim warned that MOM will take action against employers who discriminate against local workers in hiring. The number of these bosses put on the Fair Consideration Framework watch-list stood at 250 as at the end of last month, but many have improved and adopted "fair and progressive practices", he said. 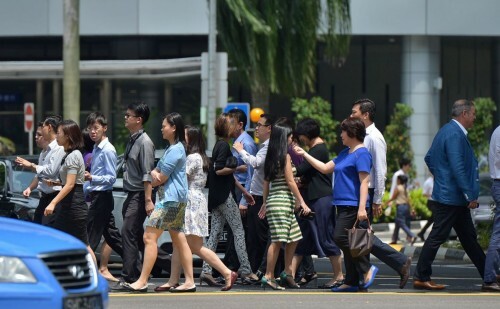 There are still 50 employers on the list who have not been receptive or cooperative; MOM has rejected more than 500 Employment Pass applications from them, said Mr Lim. Building fair and progressive workplaces: The minister said the Tripartite Alliance for Dispute Management (TADM) and the Employment Claims Tribunals (ECT) will open as scheduled on April 1. He described them as "major steps forward in strengthening our employment protection framework". Mr Lim said Tripartite Standards will also be introduced to complement existing employment laws and Tripartite guidelines to push for progressive practices at the workplace.